Coldwater Remains An Attractive Site for Winter Shufflers!! By Gary Pipher. 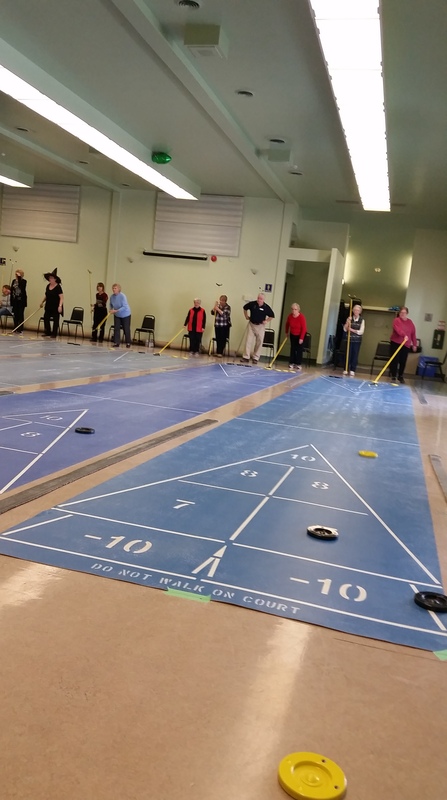 Gary Pipher Speaks: The Coldwater Shuffleboard Club continues to attract players to the ever popular recreation of Shuffleboard every Tuesday at the Coldwater Municipal Arena . The play begins at 9:00 am with a coffee break after 2 ends of play and a lunch break at noon . The afternoon play begins at 1:00 pm and a similar format is followed. Some players choose to play in the morning while others choose to play in the afternoon and many stay for the full day. The games consist of scrambles and sometimes a mix of Hoss Collar is thrown in for good measure. Since we only have 6 roll out courts no one is ever turned away if there are more players than places. Sometimes they will play 3 to an end for the game of Hoss Collar and the players enjoy the action and the challenge of this combination. Today, many of the players dressed for Halloween and got into the spirit of the season. The Club President Carol Archer shown in the photo at the top, is flanked by George O’Reilly and Merv James and were just one example of the costumes worn by the players. 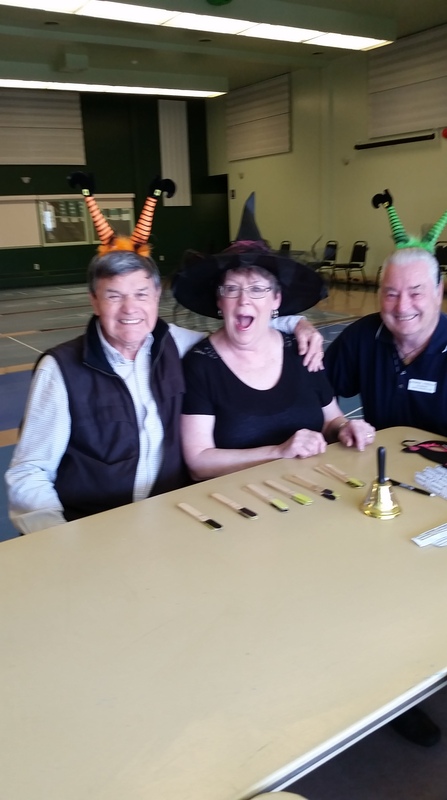 The shuffleboard club is forced to take a two week break in the schedule as the Village Players theater company will take over the auditorium of the Municipal Arena and their stages , props and equipment are rather difficult to dismantle and reassemble so its left in place undisturbed. Several of the shuffleboard players will be heading south on Nov 1 and will no doubt be involved in shuffleboard somewhere in Florida or Arizona at their winter homes. Gary Pipher: Reporter extraordinaire for the Coldwater Shuffleboard Club. 2018 10 30.